As I mentioned in my previous post we spent last weekend in East Sussex for Jim’s sister’s wedding. She was engaged for about a year before the big day and right from the start I planned to make her a quilt as a wedding present. So over the last 12 months I’ve done a lot of thinking about making her a quilt and quite a few sample blocks of quilts that I abandoned. Then a fortnight ago I announced to my husband that it just wasn’t going to happen and we’d have to buy her something from her wedding list instead, news that he took completely in his stride. The day after I told him that I walked in to the Eternal Maker, saw a fabric that was perfect made firm and bold decisions about accompanying solids and the design I was going to do and walked out with everything I needed to make the quilt. So then I had two weeks to make a quilt that I could have started 50 weeks previously. Gahhh! Anyway, it turns out that sometimes things come together better under pressure. The tight time limit meant I stopped fretting about the actual design and settled on 6.5 inch blocks and what most people know as “my colours.” The loose theme for the wedding was bicycles and planes (she’s an air stewardess, he’s a bicycle fanatic) and I found a fabric that contained both so I had to abandon any concerns about the fabric being too modern or too childlike or too anything else and just go with it. I paper pieced the letters and numbers using the My First Alphabet Pattern, I used to applique personalisation which is quick, but these days I prefer the lettering to be part of the quilt structure these days, although it does take an insane amount of time to do! The number “8” contains 38 seams just on its own and I reckon it took at least 8 hours to paper piece the names and numbers…. Thank heavens they had short names at least! Halfway through the fortnight that I was making this, I ran out of Kona Sage and had to order more before I could finish the top which meant it was Wednesday night before I actually basted the thing, Thursday that I quilted it, Friday that I did the binding and Saturday that I gifted it. Sometime between the last hand stitch on the binding and leaping in the car to drive an hour and a half along the coast for a family dinner on the Friday night I managed to get a few pictures, but wind and strong sunlight and not the best of friends when you are trying to photograph a quilt! I’ll be honest it’s not a perfect quilt. I wish I’d started it earlier and spent more time on some parts, but then what quilt ever is truly perfect? Aren’t their imperfections part of the story that they carry with them… I hope so. 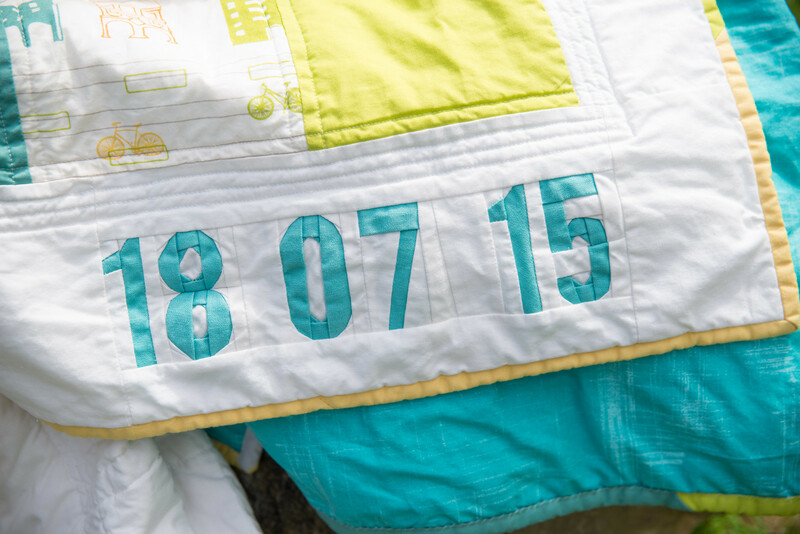 I think it’s wonderful and I love that the names and dates are a part of the quilt; appliqué is very pretty but the 8 and the & you just want to keep looking at to work out how it was put together! It’s gorgeous!! Amazing job, so glad you did it in the end as it really is beautiful. You should sell them, I’d buy one! 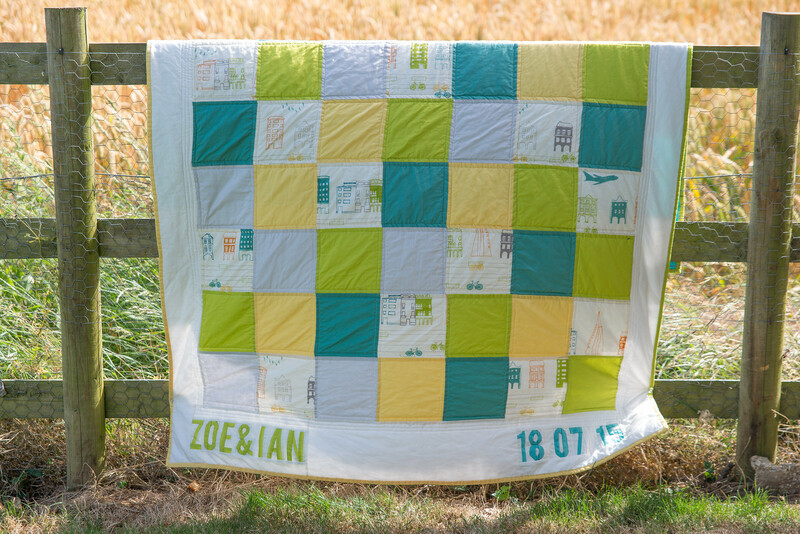 What a gorgeous quilt – stop worrying about the imperfections – the colours are gorgeous and modern. 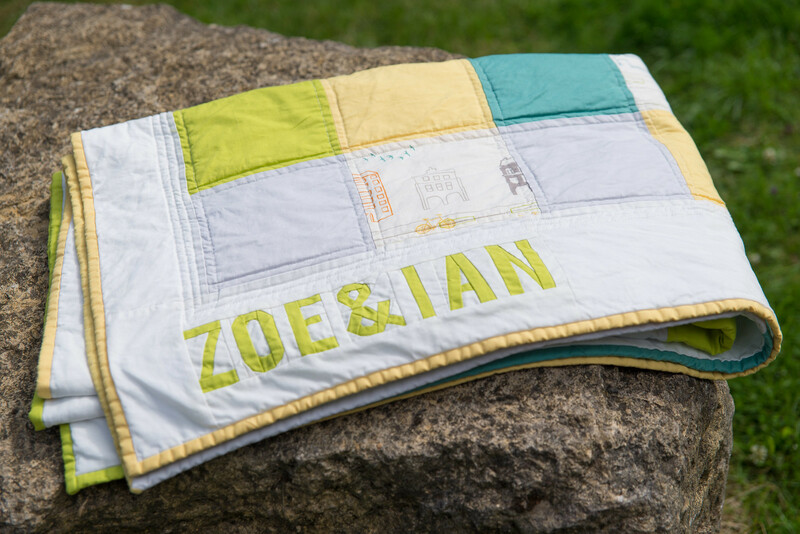 How wonderful to have a quilt with your names and the wedding date. Lucky bride and groom. Thank you Nancy. Aren’t we all terrible the way we beat ourselves up about things we have made!